Baking and Cooking, A Tale of Two Loves: Baking Chocolate Mini Stars With Anna and an Award! 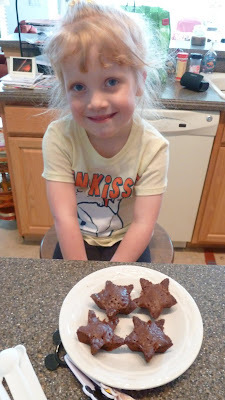 Baking Chocolate Mini Stars With Anna and an Award! I have been so excited about raising $660 for the American Cancer Society, but I needed to get away from the computer. I went to see my friend, Carolyn, and her Granddauhter, Anna, who had been home sick from pre-school, so Grandma was watching her, while her Mom and Dad were teaching. Anna and her big sister Emma, are my "shared grandchildren". My friend Carolyn has graciously "shared" Anna and Emma with me, since they were born, because I don't get to see my Granddaughter, that often. When I see Ann and Emma, we usually bake something, play, and have tea parties! We have so much fun, and yesterday was no exception. A fun time was had by all. Because I wasn't sure how Anna was feeling, I wanted to do something quick and simple. 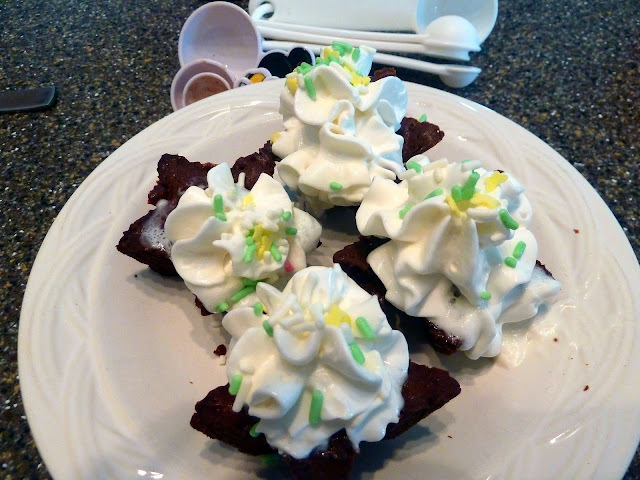 I found this recipe for Chocolate Spice Cupcakes for Two, from Stef at Cupcake Project which you "bake" in the microwave. She writes recipes for Paula Deen. You "bake" the cupcakes in silicone cupcake liners, but I only had little mini silicone star liners, so that is what we made. This recipe is so simple, and quick, you won't believe it. You whisk the dry ingedients together, add the wet ingredients. We sprayed the silicon liners with cooking spray, and they didn't stick. Mix, and microwave for 1 minute 30 seconds. The recipe calls for fresh whipped cream on warm cupcakes. We used the one in the can, because that's the kind we had. Then add sprinkles and enjoy. Go to Paula Deen's site for the recipe. This would be a fun, quick recipe to make with the kids! These stars turned out like little brownie bites. I imagine if you had the regular size silicone cupcake liners, the texture would be that of a cupcake. What beautiful cupcakes, I hope Anna feels better!! Thank you for the award, I am glad you raised so much! Awww, Becky! Your heart of gold is filled with altruism...I'm sure these delicious looking Mini Stars brought a smile to Anna. It was my pleasure to participate in the Online Bake Sale to which you have my commendation for all the hard work you put into making it a success. Thank you for the award Becky and Happy Mother's Day to you! Thank you! Anna went back to pre-school today! Kim- Thanks, I'll keep you posted on the Relay. It's June 24th. Brooks- thank you for all of your kind words. I'm going out to dinner Satuday with one of my sons and my daughter-in-law, and the Sunday, I'm going to the Cubs game with my other son and his fiancee. It will be a great weekend! Congratulations, Becky! What an amazing figure you raised. Fantastic job. Well done to all the other bakers, too. Have a relaxing weekend! Thanks for the award, Becky, but it's YOU who deserves a big award for organizing such a great effor Hope your Relay goes well for you too! Thank you for your kind words. I'll keep you posted on the Relay. I am glad that your online bake sale is a success. Keep in touch. I would love to help again in the upcoming bake sale. This was so awesome... I hope someday I can help and participate... wonderful job you did here...hope she feels better ! Congrats to all who participated you did a great service to help in the research of this dreadful disease! Thank you Becky! I am honored. I will be always happy to help with some baking! Have a wonderful and relaxing weekend. You deserve big hugs for raising all of that money and doing so much hard work! You are a treasure Becky! I love the mini stars...cuter than regular cupcakes, especially for a little one! Congrats again on raising all that money and thanks for the award. Btw, your grand daughter is adorable... seems like you both had a lot of fun making these cute cupcakes! Thank you all for your wonderful comments. This is why I do the Relay, because I am able to do it. It is for the people who aren't able to Relay, because they are fighting cancer! Becky-Again, you did such a nice gesture, baking with little Anna...so adorabel, and happily posing for the photo. Love the pretty whipped cream stars on the yummy star cookies! Thank you for all your hard work and raising such a generous amount for the American Cancer Society. I was so glad to be a part of it, baking, and donating, as well! Thank you for the beautiful award, and will post it on my blog! you did a great job with the bake sale Becky! Thank you so much for letting me take part in it! I'm glad you got to spend some time with Anna, she is adorable, and I'm sure she had a great time with you making those delicious mini stars! I love this recipe. Such a great one to do with the kids!! And I'm so happy about the success of the bake sale. Everyone brought such amazing goodies. Hope you have a fantastic Mother's Day Rebecca Ann! thank you so much for being a baker,a n all of the heip and support you gave to the bake Sale. I can't thank you enough! Chef Dennis- Thank you so much for baking for the bake sale, and the support and promotion you gave to it. I always have fun with Anna and her sister, Emma, when I see them. Kontasnt Craver- thank you so much for stopping by, and that you like what you see. Brandie-Thank you for all of your support and promotion the Bake Sale. I certainly appreciate it. I'm so glad to hear your bake sale was such a success!! Congrats on raising all that money for such a worthy cause! Such adorable cupcake stars! Hope you had a great Mother's day! Wishing you Happy Mother's Day!